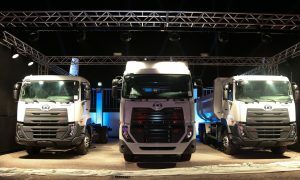 UD Trucks unveiled its New Quester in the Middle East, East and North Africa (MEENA) at a special launch event yesterday in Bahrain. For the first time in the region, the Quester is available as a high roof sleeper for long haul applications. Horsepower has also been boosted and other enhancements help to improve the truck’s overall fuel efficiency, productivity, connectivity and supporting services. The company told the local truck industry that it was worked to meet the demands of developing safer and more comfortable and efficient fleet vehicles. The truck consequently offers options of new features such as the automated manual ESCOT (Easy Safe Controlled Transmission) transmission and UD Telematics. “To be introduced in fast-growing regions around the world, the launch of New Quester highlights UD Trucks’ unwavering commitment to “Going the Extra Mile” for customers’ businesses,” said the company. UD said that a rise in fuel costs is increasing operating costs in the region and claims the New Quester delivers enhanced fuel efficiency of up to 10% over the current model. This is aided by the ESCOT automated manual transmission, lighter tare weight and optimised driveline, and is also affected by the operating conditions, driving behavior and vehicle maintenance, company executives told T&FME magazine. They added that UD Telematics makes it possible to connect directly to UD Trucks workshops to monitor and detect each vehicle’s condition and service needs before a potential emergency occurs. Preventive maintenance analysis guides customers via monthly driving behaviour and fuel consumption reports, ensuring higher uptime and optimized fuel economy over time.